Cup of Joe has a wonderful new opportunity that I would love all of you to pray about with me. One of the largest direct mail companies in the country has chosen the Cup of Joe book to be part of a test in their new nationwide campaign happening on October. They will be including this book in a marketing mailer of 100,000 pieces. That in itself makes me so excited! Imagine 100,000 people having a chance to read this book! So my publisher, Word & Spirit (Tulsa, Ok), led by a great friend Keith Provance, printed some books to fulfill any possible orders. This is a supernatural opportunity for our ministry and those connected to it. That is why prayer is right now is so important. If the test is successful, they will include Cup of Joe in their regular mailer, which means that this book would be featured in another mailer that would reach multi-millions! Imagine a couple million people starting their day like you with a cup of Joe! That's incredible, right? I have always believed that the Lord allowed me to write this “rich blend of inspiration for your daily grind” for anyone that needed a little hope and encouragement. 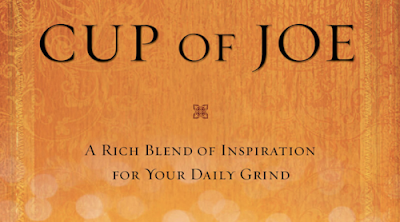 I wanted people to smile every time they hear the phrase "cup of Joe . I see the possibility of a Cup of Joe for teens, or Single Families or Kids, etc. Everyone could use a little encouragement! It's been such a joy to write these articles and share them in all of the ways that the Lord has allowed them to be utilized. We use our webpage, and other social media sights like Facebook, Twitter and Instagram. Over a dozen countries totaling more than a half a million people have visited our webpage. But my favorite moment happened last week when I visited a Chik-Fil-A in another city a half hour from where I live and the woman behind the counter recognized me and said, “hey I’m on your thing!" I was a bit taken back and said, “what?” She said I am a follower of Cup of Joe! What a blessing to know that there are people who find some great quotes and uplifting words here every day! They have told me that our test mailer ships on October 2nd. My prayer is that the Lord could use this opportunity to enlarge the influence and reach of our ministry and this special resource. Would you pray with me for whatever the Lord might desire? We won’t have the results for about 90 days but that means this next year could be life-changing for all of the hopes and dreams that are in our heart. And please pray that the Lord would bless the company that has decided to choose this book and share it with the world. And for my publisher and all of the new books that they are in the process of printing to help point others toward Christ. Thank you for reading these quotes, blog posts and especially for sharing them with all of your friends on your social media accounts. Every time you share a post, another person might smile and be inspired to do the things that the Lord is calling them to do. And if you want your own copy of this book now, you can get Cup of Joe on Amazon or through the Apple Store-iBooks. I am so grateful for your support and your prayers. Thank you for being a part of my life and the things that the Lord is calling me to do through written and spoken words. Thanks be to God, who always and in ALL WAYS causes us to triumph. May your cup (of Joe) always be filled to overflowing!